We’ve been encouraging everyone—from customers to partners and from developers to analysts—to register for Acumatica Summit 2019 right away. Why? Because we want them to benefit from our early bird pricing before it ends. Friday, November 9, 2018 at 11:59 pm PST. This is the date and time when our special early bird pricing is no longer available for Acumatica Summit 2019 (January 27-February 1, 2019). Registering after this date means attendees will lose out on substantial savings. Registering right away makes fiscal sense, and we want every attendee to take advantage of the early bird rates before they become obsolete. Those who do can look forward to enjoying all that Acumatica Summit 2019 offers at a discounted rate. As to what the Summit offers, attendees at our week-long cloud ERP software event will witness live demonstrations and gain insight into future product roadmaps for Acumatica during the Keynote and General Sessions. They’ll have their choice of specific breakout sessions, hands-on training tracks, and instructor-led certification sessions. Attendees can also anticipate meeting Acumatica’s leadership, product, and engineering teams, all of whom will be around for the duration of the Summit. 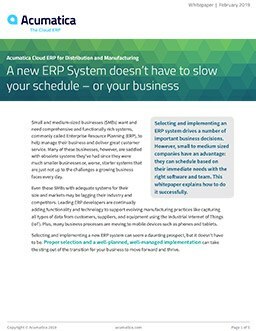 Leading ISV providers will also be available to discuss and answer questions about their cloud ERP extensions for Acumatica. Plus, there will be networking opportunities galore during the Partner EXPO, the Monday night Celebration Party, and more. Now that you know what you’ll be doing at our premier cloud ERP event, here’s the where: Houston, Texas. It’s easily accessible and centrally located for our global community, has an amazing venue (the Marriott Marquis Houston), offers great food, and has unique visitor attractions attendees won’t want to miss. As the fourth most populous city in the U.S., it offers a unique—perhaps unexpected—multi-cultural experience. Houston is an ideal location for our diverse group of attendees. Acumatica’s Kim Plank wrote a recent post explaining why Acumatica Summit 2019 is superior to other cloud ERP software events. She cited four reasons: face-to-face connection with an amazing community; insight into Acumatica’s tailor-made, comprehensive cloud ERP software; superlative training; and a top-notch venue and location. If Kim’s reasons plus the early-bird savings aren’t enough to get you to register for Acumatica Summit 2019 right now, let me give you one more: closing speaker Mike Massimino. He’s a former NASA astronaut and a current professor, author, and more. He’ll share about his experiences in space and how teamwork, leadership, passion, and innovation can translate into the cloud ERP space. And here’s just a few more things you can get if you register by or before Friday, November 9, 2018 at 11:59 pm PST: a room within our reserved block of rooms for a special rate (though these are limited, so time is of the essence), a spot in our popular and limited-seating training classes, and the possibility of lower airfare if you book earlier than later. We want Acumatica Summit 2019 to be a value-filled experience for every attendee. Take advantage of our early bird rates before they fly the coop. We hope to see you there! Until then, contact our team today if you have any questions or feedback about our upcoming Summit or our cloud-based ERP.